Have you ever found yourself unintentionally involved in a conflict? Or perhaps you involuntarily started a skirmish, and now you face a battle that you’re not sure you’re going to win? If you answered “yes” to either of these questions, then you know a bit about what it must feel like to be Katniss Everdeen in The Hunger Games. After being willing to sacrifice herself to save her younger sister, who would have been a totally vulnerable and inexperienced fighter, she has transformed into a formidable warrior who is capable of leading a successful rebellion against a very corrupt system. She (literally) shattered the Hunger Games, and now Katniss will be the rallying point for the Districts’ attempts to overthrow their oppressors. And neither would we—right? Like Katniss, we all would rather just have peace and be with friends and family in a stress free environment. Unfortunately, neither our world, nor The Hunger Games world, is set up that way. So, we would be wise to—like Katniss—find our own personal Mockingjay! In The Hunger Games, the Mockingjay is a symbol of rebellion towards the Capitol and a mockery of their failed attempts at spying on the Districts. To Katniss, it is a reminder of what she is fighting for and how vulnerable she is in the war she never wanted in the first place. So what is your Mockingjay? In other words, what symbolizes your commitment to the spiritual war we fight in every day and reminds you that we can never get comfortable or lose our focus on THE Cause of Christ? Look, I am with those of you that long for a more comfortable and conflict free life, but hey, whether or not we asked for it, when we trusted in Jesus for salvation, we joined the fighting forces of rebellion against the gates of Hell itself! and died a criminal’s death on a cross (Philippians 2:6-8, NLT). Jesus’ death and resurrection started a war for the souls of all mankind. Like the Capitol, Satan wants to maintain control over the world and keep all his subjects in complete subjugation, but God left us here when we were saved so that we can help take down the kingdom of darkness! So I have a cross in my car to remind me to pray for my friends and family when I’m driving. I have a cross at my desk to encourage me to fight the good fight against the world, the flesh and the devil each and every moment. I even have a cross in my bedroom to remind me that Jesus is the reason I have breath in my lungs and a fire in my heart to serve Him from the beginning to the end of each day. Then Jesus said to his disciples, “If any of you wants to be my follower, you must turn from your selfish ways, take up your cross, and follow me” (Matthew 16:24). The message of the cross is foolish to those who are headed for destruction! But we who are being saved know it is the very power of God (1 Corinthians 1:18). As for me, may I never boast about anything except the cross of our Lord Jesus Christ. Because of that cross, my interest in this world has been crucified, and the world’s interest in me has also died (Galatians 6:14.). So if the Hunger Games motivates you to fight injustice, find your Mockingjay and get in the battle for THE Cause! Sometimes having a symbol can really be helpful in reminding us of what is truly important, and nothing is more critical than THE Cause of Christ! This week, think through what might help you stay focused in serving Jesus. GET: Dare 2 Share: A Field Guide to Sharing Your Faith. This practical, how-to “survival manual” serves as a ready reference for relationally sharing your faith. Throw it in your backpack for easy access to the invaluable faith-sharing tips and tools you’ll find in this practical, real world resource. Features profiles on various belief systems, including compliments and conversation starters that will help you open up honest, authentic spiritual dialogue. LEADERS: Be sure to check out the Discussion Guide for this week’s Soul Fuel – What is Your Mockingjay? located at the bottom of the page at this link! Raising a son to become a God-honoring man is no easy task. It’s complex, it’s dynamic, and it requires a lifetime of investment. But authors Brock Morgan and Mark Oestreicher know it can be done—confidence that’s rooted in their individual journey of faith and in their experience as longtime youth workers. 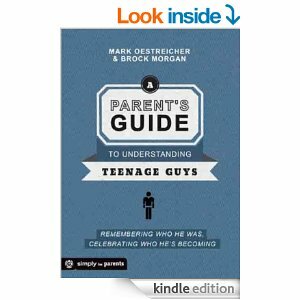 A Parents’ Guide to Understanding Teenage Guys will help you see your son through the eyes of Jesus and will inspire you to seek God’s insight and wisdom as you accompany him on this journey filled with failure and triumph, defeat and victory, joy and sorrow. You’ll discover insights on shepherding your son, preparing him to take the reins of his life, and helping him confront the extreme struggles every guy faces—such as loneliness, anger, lust, apathy, and technology. 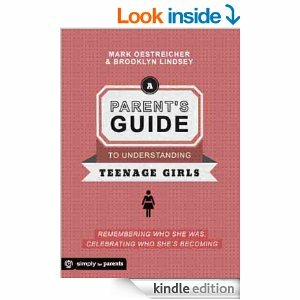 As you read through the pages of A Parent’s Guide to Understanding Teenage Girls, veteran youth workers Brooklyn Lindsey and Mark Oestreicher will help you re-examine some assumptions and misunderstandings about this season of life. Then, from a place of trust in God, you will gain a fresh perspective on who your daughter is and who she’s becoming. Help your children thrive during both good and challenging times. Adolescents need to know that they matter. It is every generation’s purpose to repair the world. This makes it an imperative that each young person learns that he or she can make a significant contribution whether to a single other person or to the planet. Young people who understand the importance of service gain a sense of purpose that can build their own resilience and further their own success. Real service opportunities exist everywhere. Your child does not need to build a water purification system in a far away land to garner the benefits that contribution offers. There are needy among us. Some may reside in shelters, visit food kitchens, or be recuperating in hospitals. Others may be our neighbors, whether a lonely elderly woman who needs help shoveling the snow, or a sixth grader who needs just a little more confidence in math and could use help with his homework. • Kids who make contributions to others learn to see beyond themselves. Young people who give rather than just receive will learn that the universe doesn’t revolve around them or owe them everything they desire. They begin to see beyond their isolated, self-oriented circles. They recognize themselves as part of larger communities. • When young people serve others they receive positive feedback that protects them from some of the negative, destructive messages about youth. They hear from numerous people besides their parents, “I think you matter,” and absorb the important belief, “I have high expectations for you.” They are surrounded by thank-yous rather than condemnation. Because kids live up or down to expectations set for them, these thank-yous can be highly protective. • Those who received service give back through the gratitude they offer. When they are adults they offer an extra sets of eyes noticing and monitoring the teen, eyes that both protect because they expect the best. When they are children they seek role models, and nothing protects teens like knowing they are role models to others. • Contribution helps young people forge connections with their neighborhoods, schools, and world. They see beyond themselves and recognize their place in the human family and on our common planet. The more strongly they feel connected, the more resilient they become. They come to appreciate their blessings and with gratitude, learn to give something back. They will also learn that giving and receiving, sharing during times of plenty, and asking for help during difficult times are normal, healthy things for humans to do. We want our kids to know that just as they give, they can receive. • Adolescents who volunteer and contribute to worthy causes not only gain confidence, but also avoid problems. The Minneapolis based Search Institute, a nonprofit organization whose aim is to promote healthy children, youth, and communities, has reported that children and teens who volunteer just 1 hour a week are 50% less likely to abuse drugs and alcohol, smoke cigarettes, or engage in harmful behaviors. • When adolescents become involved in volunteer activities, they may work with adults who are good role models. As they work alongside adults who contribute to worthwhile causes, they not only learn specific skills, but also connect with adults who are working to make a difference, and that will have a lasting influence on them. • Contribution isn’t only about good deeds and noble actions. Kids need to know that they can contribute ideas that will be taken seriously and respected. When adults invite their suggestions and opinions, especially about matters that concern them, we increase their sense of control, which in turn enhances their resilience. • The ultimate act of resilience is to turn to another human being in times of extreme need and say, “Brother or sister, I need a hand.” This is never easy, but may be necessary. We want young people to become adults who can seek help without shame or stigma. If they have the experience of service, they will have learned a vital life lesson: It feels good to give. People who contribute to others’ well-being don’t feel burdened or put upon, they feel honored, even blessed, to have been in the right place at the right time, perhaps with the right training. They often get more than they give. People with this experience can turn to others more freely later because they’re equipped with the understanding that the person guiding them through troubled times is there because he or she wants to be there – not out of pity. Young people deserve to learn this lesson through the opportunity of making a genuine contribution to another person’s life. They will learn there is no shame in reaching out, only a moment of authentic humanity. Dr. Kenneth Ginsburg is the author of “Building Resilience in Children and Teens: Giving Kids Roots and Wings” as well as “Letting Go with Love and Confidence: Raising Responsible, Resilient, Self-Sufficient Teens in the 21st Century” which he coauthored with Susan FitzGerald. So it’s confession time. I’ve followed the blog posts that Reggie and Kara have posted in the last few week, and I admit it stirs a tension in me. I think it’s generally true that people change when the pain associated with the status quo is greater than the pain associated with change. Whether the issue is weight loss, music in your church, finances or friendship, most of us only change when our current situation becomes painful enough to motivate change – and sometimes the pain has to be quite significant to provoke deep change. The tension I see is that the culture we live in moves us to greater and greater personal comfort. We don’t have to get up to change a channel, change the music, and can drive in without an appointment to change the oil on our cars. We don’t even have to wait for dinner. Everything moves us (and our kids) into greater and greater comfort. Which leads me to my confession: I actually like comfort. Chances are you might to. I think our kids don’t mind it either. And that makes serving difficult. There will be very little pain associated with the status quo of not serving. Face it: serving others is rarely convenient. It’s often expensive. It takes energy, time, effort and often money that we could spend on ourselves. Which is why if I’m going to serve Christ and serve others, I need to make myself do it. I wish I was a good enough person to wake up every morning and want to serve others. But I find it’s more of a discipline – like working out or eating well. If I wait for the moment of spiritual maturity where serving others is automatic, I be very old when it arrives. Or dead. How about you? Do you have to fight the status quo? What have you found effective in helping you make serving a priority? What has helped your family engage the tension of learning to serve?